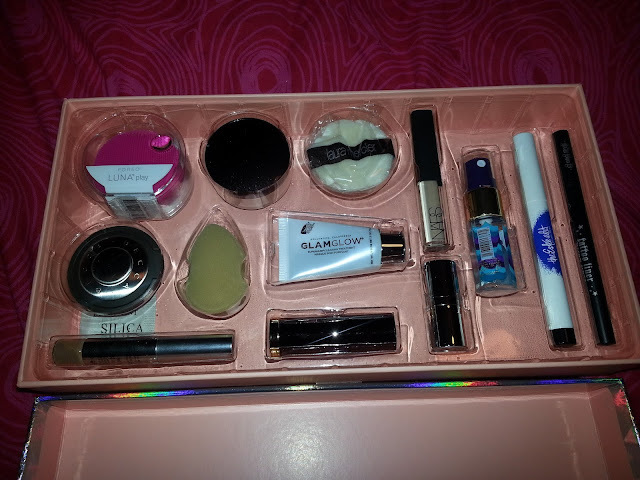 As soon as I saw sneak peeks of this Sephora Favourites box, I KNEW I had to have it. When it launched, I immediately made my purchase, and it came the next day. I love Sephora's shipping. And I love living close to their warehouse facility! This was one of the top reasons that I purchase this. I've wanted to try a Foreo for the longest time, but I could never commit to spending over $160 Canadian on something I wasn't sure I would like. The Luna Play is a smaller version of the full size. It fits in the palm of my hand. The only downside with the play version is that it's estimated to last only about 100 uses, and the battery is not replaceable or rechargeable. But I'm sure that is plenty enough to determine whether or not it has made a difference in your skin, and if it is worth investing in a full size version. The value of this alone is $49 Canadian. This is a pretty highlighter, it's a pale gold. Becca Cosmetics are great, however I have a full size champagne pop that I really need to get through, as well as a poured creamy version of moonstone. So I decided to pass it along. This is only a sample size at 0.08 oz (full size is 0.28oz @ $46) so I value this sample to be about $13.14. This is a cream/gel for your eyebrows. They sent this in shade 3 which is described as light to medium brown, redheads (neutral warm) so it may work for most people, however it won't work for everybody. This is also a sample size at 0.03oz (full size is 0.1oz for $30) so I value this sample at $9. This is another item that I really wanted to try. I've heard great things about this translucent powder, especially for baking under the eyes. I haven't had a chance to try this yet as I'm trying to finish up another powder, but I will definitely get a review up once I do! This is a travel size at 0.33oz (full size is 1oz for $47) and Sephora has it listed for $28. Ah, a full size beauty blender! Another item to add to the list of wants. I have a pink one, and I love it. I actually just replaced it not too long ago, so this wasn't really needed right away, but since it is included in the kit, why not. It's not like it's an item that goes bad, so I will use it once it's time to replace my old one. Since it is full size, it is valued at $28. This concealer is probably my most favourite of all times. It's creamy, it has good coverage. It does crease a little bit for me, however all of my concealers do that. Must be my eyes. Anyway. I have dark circles, and I'm super pale, so it's always hard for me to find a concealer that can help me out. Nars is one of the very few that does. However, this is not my shade at all. I wear chantilly, the lightest shade they make, and custard is about 4-5 shades darker. I knew this wasn't going to work for me before I placed my order, so I made sure to put it aside to gift to someone else. This is one of those items that are not going to work for most people. So while I love the product, I kind of wish it was customizable or they included something different. This is a travel size item, and Sephora has it valued at $16. Another highlighter. It's a pretty shade but I haven't tried it out yet. It is described as a soft rosy peach shimmer. This is another full size item, valued at $24. It's so small! This is supposed to be a primer, makeup setting spray, hydrating mist, and skin refresher, all in one. I enjoy the smell of it (it kind of smells like oranges) but I don't find it works well for a makeup setting spray. My makeup still transfers. It does help hydrate and refresh the skin though. I do prefer the smashbox primer water over this. This a super small travel size item at only 0.24oz (full size is 2.5 oz for $30) so I value this sample to be only about $3. This is a three-in-one, highly-pigmented eye shadow, liner, and primer that lasts up to 24 hours. I'm not a fan of these types of products to use as a liner, and its black, so it would be way too dark for me to use as a shadow, or primer. I'm trying to pass this along to someone who may be interested. It is full size and is valued at $26. This is another product I really wanted. I still have not tried the Kat Von D liners, so I was excited to see this. It is full size, and valued at $25. So over all, I still feel this is a great set. You get a good variety of products to try out. I've estimated the value to be about $261 if you purchased this all separately (even more if you went full size for all!) so for $90 it is a good deal. 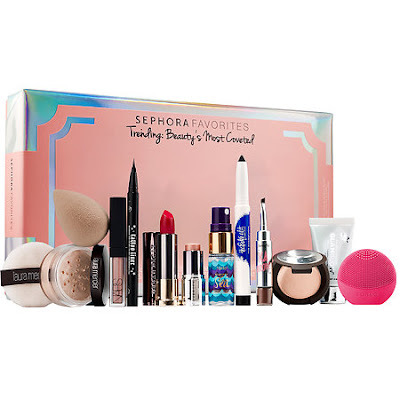 Say you decided you wanted to order just a beautyblender ($28), Kat Von D liner ($25), and full size Laura Mercier translucent powder ($47), you're already looking at $100! I'm glad I managed to snag one this year!